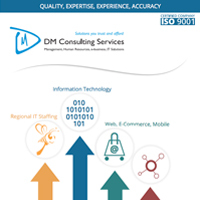 DMCS’ IT products and services are guided by its philosophy of “one-stop” shop composed of the following categories: web, e-commerce, mobile, SEO, various IT services. Our services and solutions are tailored to the specific needs of our clients and partners, and they remain always cost effective comprehensive IT solutions and based on the most up-to-date innovative design and development technologies. For more information, please read the DMCS Brochure next to this paragraph.